Have you ever been in the midst of 35,000? Teens? Voices? Believers? It was like nothing I had ever experienced. Our little group of six (two adults, four teens) in the midst of it all. The city. The song. The worship. The story. We were just the tiniest part of the whole... giving ourselves bit by bit to the experience. 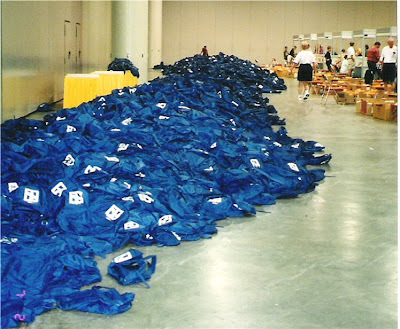 Registration alone was quite something... everyone checking in and digging through the depths of their gathering backpack. We joked about the purple and were amazed that each contained a bible, published specifically for our event. Walking the city blocks back to the hotel we marvelled at the brilliance. Yes. Purple backpacks. On 35,000 backs. The conference had barely begun and already we were making quite a statement of faith within the city that is known for Bourbon Street and the rowdiness that goes on there. No one walked by without wondering... and I suppose they continued to wonder when they gained the knowledge that the Lutheran Church had sent their teenagers to New Orleans. Yes. An unlikely city to gather in. But why not? Why not fill the streets with young life and faith? On the first night, we gathered in the Super Dome. It won't surprise anyone to know that I cried. Arms raised in worship, and completely in awe of my surroundings. If there are that many young hearts, gathered under one roof, loving Jesus... then just maybe... there is hope for tomorrow. The music began and the song raised the roof. And as we all prayed... there was just the quiet. And it moved me more than the song. In the days to come, the Dome became our home base, with a white cross hanging at the center of it all. The days were spent at the convention center... attending concerts and classes and digging deeper to know God. We participated in a Servant Event and explored the city by scavenger hunt. We took a river boat ride and a trip to the Mardi Gras museum. There was an indoor carnival and endless opportunities to play. The favorite event was the opportunity to lend their hands to the city that welcomed them. There were about 60 of us... teens and chaperones. 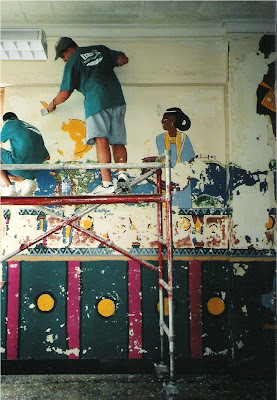 Our mission was to paint an elementary school, but when we arrived, the walls still needed to be scraped. The two dozen scrapers didn't go too far, but our kids... they didn't seem to mind. We chose a section of the hallway and started in. Scraping the walls. With phone cards. For three hours. I have never seen any kids enjoy such hard work more than those four. Honestly, to me the situation felt hopeless. But those four... they were moved by the less and only let their hearts focus on the hope. They never tired. In fact, they were the last kids back on the bus... and only there under duress. If they could have stayed, they would have. Faith at work. I still marvel at that day. It adds to my faith... and when the world shakes their head at the kids today I think about those four kids scraping paint for all they were worth with only the tools God had given, and the 35,000 that gathered in New Orleans in July of 2001 and I know... that this world will be okay. Scraping paint with phone cards. Now that is a picture I won't soon forget. I can just see you standing there, your heart expanding more and more by the minute. Can't wait to hear the rest of the story! You paint a beautiful picture with your post. Wow. These kids ARE amazing...and so are their peers. What an amazing time for all of you. There's nothing like a trip like this to grow young people. PRICELESS!! I know you are so very proud! !